The Forum for Community Solutions and Neighborhood Funders Group (NFG) launched a new leadership fellowship for CEOs of progressive philanthropic institutions. The first cohort of 15 dynamic fellows will be the start of an annually growing network of visionary CEO leaders who share a belief in a model of community partnership that centers community knowledge and power building. Learn about the first cohort of Philanthropy Forward here. Read about the second cohort announcement of Philanthropy Forward here and the selection here. Together, fellows will be strategic thought partners, with a dedicated space to organize together, boldly envisioning and advancing the transformed future of philanthropy. A future that centers and achieves equity and social justice. Philanthropy Forward fellows unlock the challenges to philanthropy realizing its fullest role as a collective financial engine for social change. This Fellowship is best suited for philanthropic institutions that are already supporting racial equity and powerbuilding and who are looking to go deeper by building a strong peer group and aligning more towards equity and impact. Outcomes will be at the individual leadership, organizational, and philanthropic field levels. An important component will be building relationships across foundations within the 9-month program, and over successive cohorts. Consciously foster and cultivate relationships and build a network of peers to support ongoing leadership and innovation in the sector. Ultimately, the intention is to emerge with a collective identity as a financial engine for social change that centers long term impacts, community centered strategies, and advancing justice, equity and power. Estimated time commitment is 12 days over nine months, which includes three in person meetings plus some additional time in virtual sessions. This additional time will include activities such as peer coaching, content and strategy learning, and possible projects and experiments. 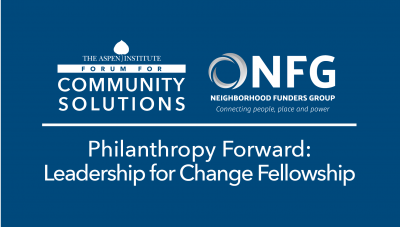 For more information, please contact Sheri Brady, Associate Director for Strategic Partnerships at the Forum for Community Solutions at: sheri.brady@aspeninstitute.org.